"What am I? I'm what's on your spoon when you pull it out of the melting pot!!" So writes a subject in California-based artist Kip Fulbeck's photo series "part asian, 100% Hapa". "The Hapa Project" just opened at the Nikkei National Museum, which also hosted Hapa-palooza's inaugural Hip Hapa Hooray awards. The evening honoured three key figures in North America's mixed-heritage community, who come from different generations and exceed in different disciplines. Hapa-palooza co-founders Zarah Martz, Anna Ling Kaye, and Jeff Chiba Stearns presented awards to Fulbeck, inventor Ann Makosinski and poet Fred Wah. Vancouver's own Buckman Coe provided the evening's music. As a small child, Kip Fulbeck saw himself as white, at least until he started school. The other kids made it painfully clear that they saw him as Chinese. Fulbeck told the crowd how his latest project blew up: he photographed 1,200 subjects instead of the 100 he had anticipated. He said that the number of volunteers varied depending on where he went, due to different levels of awareness surrounding mixed identity. Fulbeck mentioned a woman in Kansas who wrote to him insisting that he photograph her for the project, saying "You've never met anyone like me." Fulbeck then faced the awkward task of telling her that being part-black, part-Korean was not actually as rare as she thought: "To her, it's just, 'There's no-one else in the universe like me.'" When he first started working on Hapa-centric projects in the Eighties, Fulbeck found that some subjects got angry at no longer "being the special one", finding out that they were not the only mixed-ethnicity people in town. As Fulbeck put it, "You're special, but you're not special in the way you thought you were." In accepting the Community Builders Award, Fulbeck said, "I just happened to be the first one to do this stuff, and I'm really happy if some small things I did helped open doors for other people." He added that he creates the art he wish he could have seen as a kid: "I made 'Mixed Kids' because I had my son Jack. I wanted him to grow up in a world that was different [from mine], where he wouldn't go to school and get thrown in a trash can because he's Chinese." Ann Makosinski won the 2013 Google Science Fair by inventing a body heat-powered flashlight. As she took the stage, those in the crowd quietly discussed all the things they weren't achieving when they themselves were sixteen. As a child, Makosinski had to build her own toys "with garbage from around the house." The experience had a profound effect on her: rather than hate her parents, she developed a deep love of making stuff. She would dismantle random electronic devices that her dad would bring home. A self-described "weird child", Makosinski would find herself perplexed when her classmates didn't recognize her homemade Alexander Nevsky Halloween costume. Makosinski said, "Whenever people ask me what my ethnic background is, I always say that I'm half-Filipino, half-Polish, which makes me a perfect Canadian." She added, "I'm also very proud to represent Canada at science fairs and other occasions." Makosinski was inspired to build the flashlight after returning from a visit to the Philipines. She stayed in touch with friends she had made there, and learned that one of them couldn't study at night because she had no electricity. Makosinski then did what came naturally: build something. In accepting the Youth Achievement Award, Makosinski said, "To be recognized in my own province means a lot to me." Makosinski brought the famous flashlight with her. Anna Ling Kaye said, "When the concept of came up for an awards night, it wasn't really a question: we really wanted to honour Fred Wah." Canada's fifth Parliamentary Poet Laureate, Wah won the 1985 Governor General's Award for "Waiting for Saskatchewan", and the 1996 Writers' Guild of Alberta Howard O'Hagan Prize for "Diamond Grill", and the 2010 Dorothy Livesay B.C. Book Prize for "Is a Door". In 2013, he was made an Officer of the Order of Canada. His hallmark is discussing the prickly issues of race and acceptance with a dose of humour; for example, the phrase "If you're pure anything, you can't be Canadian. We'll save that name for the mixed-bloods." In accepting the Lifetime Achievement Award, Wah recounted his struggle with racial identity during the 1950s. He couldn't just put down "Canadian" on a form, since Canadian isn't a race. His teachers told him that, since his father was Chinese, so must he be Chinese. Then Joy Kogawa's "Obasan", a book about the internment and persecution of Japanese-Canadians during World War II, hit the shelves: "All of a sudden there was a voice for a very ugly thing that had happened in this country's history." During the next few decades, Wah saw the Canadian literary scene recognize racialization more and more. However, only recently did the concept of Hapa or mixed-race begin to be articulated, and that, said Wah, was because of Hapa-palooza: "There was this kind of, 'Gee! We are here! That has been such a gift, to have Hapa-palooza." 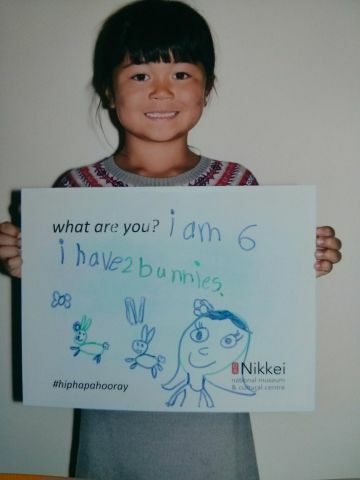 As part of Hip Hapa Hooray, visitors to the Nikkei were encouraged towards a bit of self-identification and answer the question, "What are you?" Most participants included aspects of themselves beyond race, such as "mom" or "dancer" or "Canadian. Some sidestepped the question entirely. As Kaye had said earlier, the focus of Hapa-palooza isn't on whether you're a quarter-this or an eighth-that; but that ethnic hybridity means that you can inherit the whole of each culture that brought you into the world.